It felt strange to see the grey wall in front of me as I drove down today. I felt like the legendary Bengali lover, Devdas, coming back home to find that his childhood sweetheart had got married and had gone off to her in laws. I knew that JATC Bandra had shut down a few days back. Twitter was abuzz with it. It’s just that I hadn’t seen it with my own eyes. Was oblivious to it. Till I saw the high walls coming up where the welcoming gate once was. A part inside me died. 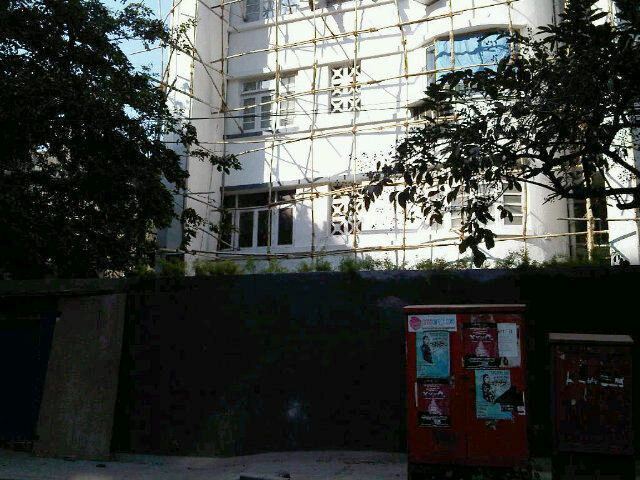 Just Around The Corner or JATC at Bandra was so much a part of my life here. It was a landmark. It represented everything that Bandra promised to a set of out of towners who had come to make their fortunes, all right who am I kidding, to get a job, at Mumbai. The atmosphere was casual, young, vibrant. You got a peep of the fringes of Bollywood. Over the years I had spotted Tabu and Mallaika Arora here. JATC was open late into the night. We could hang out here much later than what we were allowed to back home. It was a common meeting place. A place to grab a salad before catching a movie at Gaiety, Galaxy. Sarfarosh on a wet night if I remember right. The salad bar itself was so typical of our new world. It was a new concept. Symbolic of the new life we had moved into. As were the brownies and ice creams. A year of courtship followed. We would stop at JATC at least once a week for dinner. Would have been more if K could rebut my theory that ‘salad isn’t dinner’. The ‘all you can pile on your plate’ salad concept was manna to couples eating on a budget. I was an expert of talking a half plate (Rs 70, 2000-01), piling salads then more sauces then more salads...then topping it with boiled eggs and desperately searched for pieces of ham. Patting it all together with a fork to form a pyramid. Hoping that the wobbling tower of boiled stuff wouldn’t topple over before you reached the cash counter. Come on, admit it, you have all done it. Bachelorhood ended and the salad dinner dates turned into waffle breakfast outings. They had a waffle and coffee combo at JATC. That along with a Mid Day, that K would give me 5 Rs to buy with, was the only way to start a Sunday. Then Candies came into our lives, the odd trip to Crepe Station or Coffee Bean, and the breakfast trips to JATC became rare. Plus I would always end up bursting a few blood vessels as week after week the folks at JATC would never follow my instructions to get the waffles and coffee together. Of course JATC was about more than just salads and waffles. A preferred spot for her to storm off to after the noodles turned out to be soggy and over cooked. A place to pick up the chocolate milk shake that she so liked when she was home and not well. With extra chocolate sprinkles. The place where we picked up pastas one NYE when we couldn’t get a restaurant table. A place to have the in laws over for sandwiches that ‘daddy liked’. Chicken junglee, shredded ham and cheese. And boiled egg salad for the mother in law. We went to JATC after ages sometime back. The waffles were perfect. Butter and honey happily flowing over mine. Just butter over hers. The coffee was brought in at the right time. The conversation was pleasant. The morning scripted to perfection. The birds were chirping. The world was happy. Little did we know that it was our last breakfast at JATC, Bandra. Reminds me of my salad days spend with my hubby in Saket, Delhi. And then we got our first job and the salad dinner dates turned to more exotic ones. Wish we can go there again and check the good old place and see the birds chirping and make our world happier! Heard it will re-open in Feb after the renovations !! Don't worry. Restaurants never die. They just come back with new logos, new menu cards and inflated prices to pay for the renovations. such a poignant post...hope JATC opens up again soon. Don't worry Kalyan, JATC is such an icon that its sure to reopen in some other corner or in some other avatar soon. Well! Its your birthday gift. Happy Birthday Kalyan!